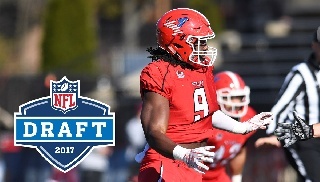 Former Youngstown State defensive standout Avery Moss was drafted by the New York Giants in the fifth round of the 2017 NFL Draft with pick No. 167. He joins fellow YSU defensive tackle Derek Rivers as selections in this year's draft. Rivers was selected in the third round by the New England Patriots on Friday. Moss, a first-team All-Missouri Valley Football Conference in 2016, spent two seasons with the YSU program after transferring from Nebraska. He finished with 59 total tackles, including 42 solo stops this past season and was second on the team with 17.5 TFLs and 11 sacks behind Rivers. Moss had a team-high four forced fumbles. In the playoffs, he had 17 tackles, 14 of which were solo stops. In the Division I National Championship Game against James Madison he had eight tackles, seven of which were solos. This is the first time since the 1984 draft that the Penguins had two players drafted in the same draft. In that draft, John Goode was selected by the St. Louis Cardinals and Paul McFadden was picked by the Philadelphia Eagles. It marks the fourth time a pair of Penguins were drafted in the same year (1979 and 1967 as well). "It's a blessing to have this chance and get to play for the New York Giants." "I'm relentless when it comes to effort. I never want to give up on a play."